Posted on 12/05/2005 at 10:57 PM. For light/medium weight saltwater use I find them just perfect. They are incredibly light, knock-about reels that can handle salt, rough treatment and most fish I target with up to say 12lb tippet. The best thing is that they are completely corrosion proof - a blast under the tap is all they need - the few metal components (on my newer ones) are all stainless steel. And even if one did self-destruct they are generally well under $90 so who cares. Some of the one's I'm using for mullet / bream / bass only cost $29. I've had graphite spools on threadlines pop after a big tussle on mono line - but so far none of my graphite reels have suffered this fate " I think low stretch backing reduces this risk significantly - and in any case I would generally be using a Felty or something similar once I'm operating with the possibility of big fish. The technology of composite material is advancing rapidly - aircraft parts, racing car parts, yacht rigging and even gun parts are being manufactured with extremely tight tolerances and massive strength / weight advantages over aluminium. I reckon it's just a matter of time before we see high-end composite reels for heavy saltwater duty too. Any experiences out there? - in particular I'm interested in any horror stories where composite graphite reels have not made the grade in light / medium fly-fishing applications. Posted on 12/05/2005 at 11:09 PM. 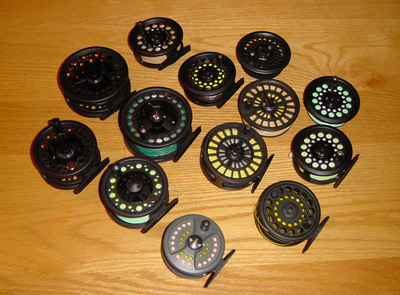 Just occurred to me the Alvey fly reel is maybe the first one of it's kind leading the way. A bit clunky but reasonably capable. Perhaps with a more high precision drag and a slight face lift it could be right up there with some of the best. Posted on 12/05/2005 at 11:58 PM. I've seen one of those Alveys in action up North. The bloke I was paired with for a few days had one and I watched him catch queenies, tuna and even a permit with it. They're big, heavy and strong. But damn they're ugly reels - a face lift would do it wonders. Posted on 13/05/2005 at 09:00 AM. As you say Jono - the biggest problem with the Alvey reels is the weight factor, they're just too damn heavy! Posted on 13/05/2005 at 02:06 PM. So the Alveys certainly don't come with any weight advantage. Posted on 01/07/2005 at 05:32 AM. I use Okuma Air Frame Compo reels On The Tongariro,The rainbows are 4to/6lb+River speed 28to32 cumacs & the fish seem to to very keen to get back to the lake in a hurry,these reels do the job $80.00.I dont think the more expensive reels do it any better,but sometimes it is nice to drive a Porshe Boxster. Posted on 01/07/2005 at 09:16 PM. Posted on 01/07/2005 at 10:29 PM. Rod there is an Okuma AirStream and an AirFrame in there somewhere - the AirFrame is the 4/6 model and is especially nice - I use it on my 5wt for light tackle salty fun with kahawai so I would fully agree with your observations on it's capability for the Tongariro. A slight drawback on both Okumas is that the star drag adjustment can sometimes snag the line - but they are robust, light and fun to use with a lovely drag. Darren the two out on the left are actually echo reels (which I got from Lionel ) and they are exactly the same as the 3Zone (at least the ones I've seen) and all are made in Denmark and otherwise known as Danica reels - but these are the newer models from Danica upgrading what was the number one selling Danica reel in the UK for many years. Quite a novel spool retention system using a compressed rubber O-ring - I'm really interested to see how these go under some pressure from a rat kingie or two this summer. I honestly would not trust any of the compo reels in my collection on a fast running tuna and don't even think of putting them on anything bigger than an 8wt. But for 8wt and below (probably about 12lb tippet) I think they are very capable. For about three years I used the Okuma AirStream for salmon and it never even came close to it's limits. 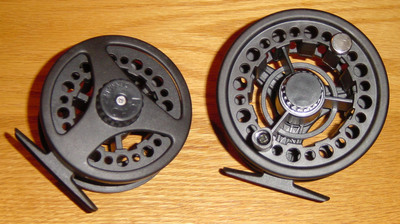 The little grey one is branded as Juro ( Shakespeare also puts their brand on it in some retail outlets) - it's marked as a 5/6 wt reel but I currently use it on my 2 weight - quite sweet with adjustable offset disk drag and outgoing clicker but I'm looking for something that really pushes the limits on drag smoothness down in the 4lb tippet category. It's a real pity that Danica and Okuma which have superior drag systems amongst the light compos don't have a smaller model in their lineups - there is a very big gap in the market for an ultra-light compo reel. Posted on 01/07/2005 at 10:48 PM. Darren here's a better pic of those two echo reels (aka Danica Tekno Large Arbor). Is it the same thing as your 3Zone? Posted on 03/07/2005 at 08:25 AM. Posted on 05/07/2005 at 11:44 PM. The spool retention on the Danica sounds similarto what Lamson use's.I've had a velocity for a couple of years now with no issues .